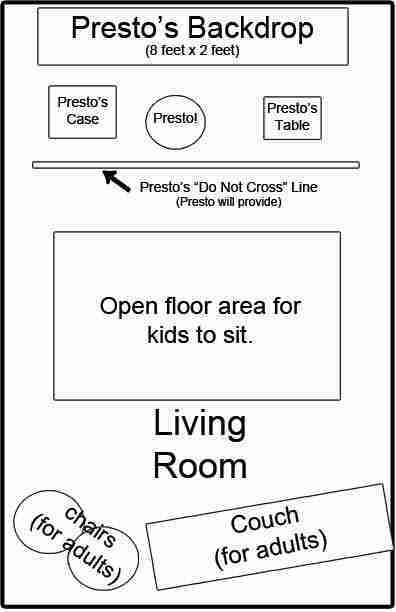 Tips for a great kid's birthday party with Presto the Magician! 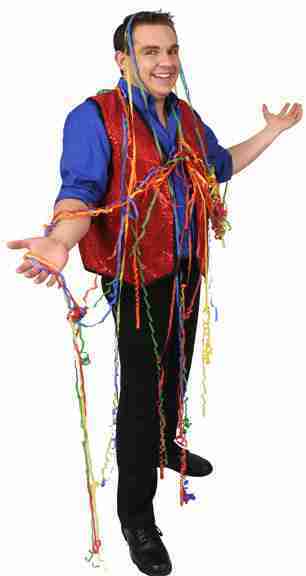 Congratulations on booking Presto the Magician for your child’s upcoming birthday party! Have a stage area arranged so that Presto can perform against a wall or in a corner. (see diagram) The show is usually best held in your largest room. The kids usually sit on the floor and adults sit with them or behind them. No one should be behind or to the sides of Presto. Think of your living room as a mini theater! The show should take place in a room separated from other distractions. Adults are welcome to watch the show with the children (the more the merrier!) or talk in another room. It can be very distracting to the show when parents are talking loudly in the back of the room. In addition, toddlers or babies younger than 3 years old must be sitting with an adult and taken out of the room when needed. Toys and other distractions should be removed from the performance area before the show begins. Please have a parking space reserved as close to the performance area as possible for loading/unloading. Presto often arrives after the party has started and parking can be hard to find. If there are special parking arrangements (parking garage, valet parking, etc.) Presto should be aware of, please CONTACT PRESTO to discuss this before the show date. For birthday parties, Presto will arrive 15-20 minutes before the start of the show. This gives him plenty of time to meet you (and the guest of honor! ), see the performance area, and set up his show. Here is a sample schedule for a two-hour party starting at 2:00. The times on the party invitation are 2:00-4:00. 3:25 – Sing Happy Birthday, eat cake or food! Opening gifts is optional, many parents opt to do that later with the family.